Exercise vs. depression is like a tug of war. When a person is depressed (speaking from experience) it can be hard getting out of bed never mind getting dressed for a workout. It's hard for most people to get the motivation to workout even when they aren't depressed. Self care can be difficult. The desire to 'look nice' isn't there and my outfit of choice is yoga pants/sweat pants and a T-shirt. As for my mood my husband would say I'm 'irritable'. My brain/thought capacity and short term memory is somewhat lacking at times. It becomes mentally harder to process things. My appetite is non existent due to the anxiety that also accompanies the depression. Not having an appetite for me means not having the fuel I need for my workouts. That however doesn't stop me as I force myself to eat. I remind myself how good I will feel during my workouts/exercise and then I try to find the healthiest most palatable food that will help me in my next workout. I don't want anything to get in the way of my natural medicine or self care - exercise! If exercise wasn't already incorporated into my life I can't imagine I could be efficient at following a workout routine. Walking perhaps but nothing beyond that. The irony with lack of motivation with depression is the most effective treatment for depression is exercise. When I was first diagnosed with depression a few years ago the only time I felt 100% normal/mentally healthy was when I was running with my friends. Ever since then I've read many articles on the topic and my psychiatrist at the time also recommended cardio exercise as an effective tool for combating depression. I'm not sure why but for some reason my depression and anxiety are coming back even while on medication. My life seemed to be going great and I was thinking to myself how well I was doing. After Halloween I then started to not feel well to my dismay. Sleep has been difficult so I've been taking prescribed medication so I can sleep through the night. I live in New England, and it's that time of year where the days are cold, gray and short with not a lot of sunlight compared to spring and summer. I'm thinking a light box may be on the horizon for me to try. As I write this I'm still feeling nauseous. It's a feeling I've had for several days. I have my professionals at hand to help me and a great support system. Something so key in combating this illness. Early this morning (5:30 am) I dragged myself out of bed and to the gym. I did weight training for about 45 minutes. It was hard getting going at first in the beginning of my routine and then I got into a grove and was feeling powerful, strong and just plain great! 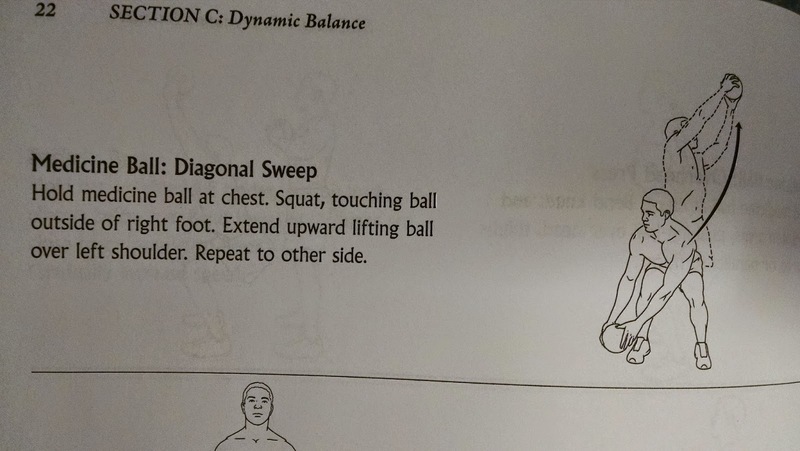 One of the exercises in my workout this morning. After getting home I got my 9 year old up for school and we went for a run outside. Again I felt great during and after my workout for some time. For breakfast I could stomach a yogurt, banana, vitamins and my medication. As the endorphins started to ware off I started to feel nauseous again. If I could exercise 24 hours a day I would! I then spent the rest of the day running errands with a friend (the sun was shinning). By the middle of the day I actually felt really hungry for the first time in days. We went to Chipotle for lunch and I had an awesome burrito bowl (brown rice, peppers, onions, chicken, mild salsa and guacamole) I ate the entire bowl!! It felt good to want to eat in that moment. It's kind of ironic that I'm trying to get in shape and lose weight (post back surgery) and my depression/anxiety is doing a great job of helping me not eat! A dieters dream perhaps? As a test I even baked a pan of brownies for my boys this evening. I ate one brownie and I didn't get any pleasure out of it (normally I would probably lose all self control and probably eat about half the pan). All I can do is take it one day at a time right now. I will get better. It's just a matter of time and treatment. Thank you for reading my post - it helps me mentally to write and hopefully give those a window into my world. Depression/anxiety unfortunately isn't something a person can just snap out of. It's a biological condition in the brain that can be improved with medication, therapy, sleep and exercise of course! Mental illness is 'taboo' or the big white elephant in society. I hope this post helps someone out there to not feel so alone. As for exercise I am thankful I have the physical ability to do so. Right now that's my 'happy and relaxed pill'. Note: If any of this post doesn't make sense please understand :-) I've proof read my writing however my brain feels like it did when I was pregnant many years ago. Somewhat disorganized at times and 'slow'. To those who are afflicted with this illness I wish you much healing and lots of support.